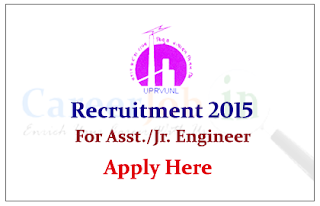 U.P.Rajya Vidyut Utpadan Nigam Limited (UPRVUNL) is recruiting for the post of Assistant Engineer and Junior Engineer. Interested and Eligible candidate can apply online on or before 17th August 2015. Company Name: U.P.Rajya Vidyut Utpadan Nigam Limited (UPRVUNL). Company Profile: UPRVUNL is wholly owned state thermal power utility with present generating capacity of 4933 MW, operating 5 Thermal Power Stations within Uttar Pradesh. Poised to contribute in the growth of state, we're in the process of adding further 1000 MW capacity to our existing fleet by year 2014. · 18-40 years for Non-Executive as on 01.07.2015. How to Apply: Interested and eligible candidate can apply online on or before 17.08.2015. For more details kindly check official notification. · Tentative Exam Date : September 2015.